On the border of China and Turkey, at the edge of the vast Taklimakan Desert, the oasis city of Khotan served for centuries as a frontier capital of trade, art, and culture. The region was once a famed stopping point on the Silk Road, a gathering place for travelers, an exchange for news and ideas, and a major trading post for the newly-connected world’s arts and crafts and textiles. Located at the crossroads of two giants--China and Turkey--Khotan served for many years as an exchange between the two, thus connecting the traditional arts of the mid and the Far East. 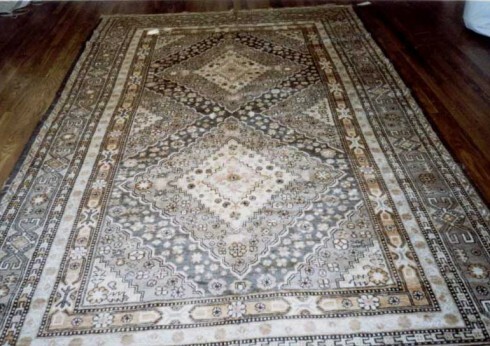 Chief among these arts were the famed oriental carpets, produced in both China and Turkey for the world market. 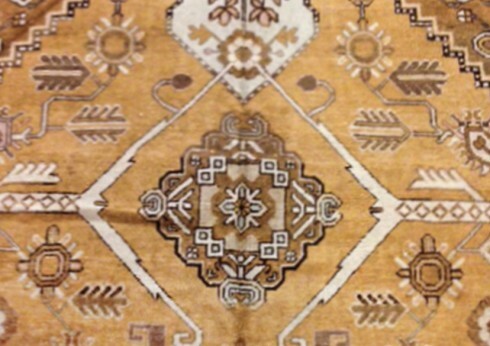 For years, Khotan served as their commercial stopping-point, but beginning in the 17th century, as the international market rapidly expanded, the trade city delved into production, and Khotan developed a significant rug-making tradition of its own. In design and construction, Khotan carpets straddle worlds: local, centuries-old tribal tradition, Chinese, Persian, and Turkish design all coalesce to create some of the boldest, most compelling antique rugs in the world. Perched between civilizations on one of the world's great trade routes, the weavers of Khotan created a synthesis of art and history. Their rugs integrate an incredible diversity of styles to create simple, often beautifully minimalist patterns. Designs draw on fretwork borders and lotus blossoms from China, carnations and pomegranate vines from Turkey, and floral trellis patterns from Persia, all distilled into Khotan patterns that can feel almost elemental in their essential simplicity. Clearly drawn, boldly delineated, typically the central motif will be of Persian origin, with field patterns and accents rooted in Chinese design. 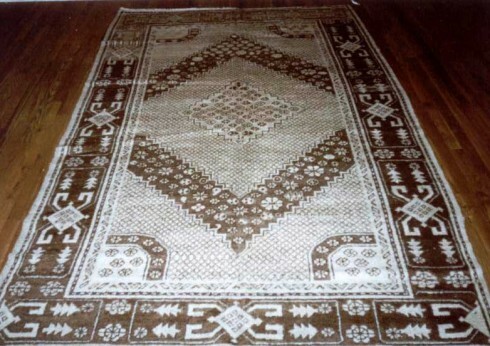 Among the most common resulting motifs in Khotan rugs are the lattice design and (rare among oriental rugs) the triple medallion pattern motif, though Khotan rugs are perhaps most well-known for their prevalent use of the symbolic pomegranate. In Khotan usage, the vine will often be growing from wonderfully detailed small vases, signifying prosperity. They tend to be long and comparatively narrow carpets, thus allowing for the beautiful, lengthening vines to truly take their highest form. Besides pattern, the rugs are known for exceptionally vivid coloring, achieved exclusively with natural dyes. Most famously, the carpets hold a particularly deep, vivid red, so hyper-saturated that when it was first introduced to the 18th century market, Khotan rugs immediately became synonymous with the deep, dark, romantic palette of which red became the essential foundation. The red stands out among Khotan’s subtler earth-tones--greens and creams and off-whites—used by dye-makers to elegantly fill out the field. 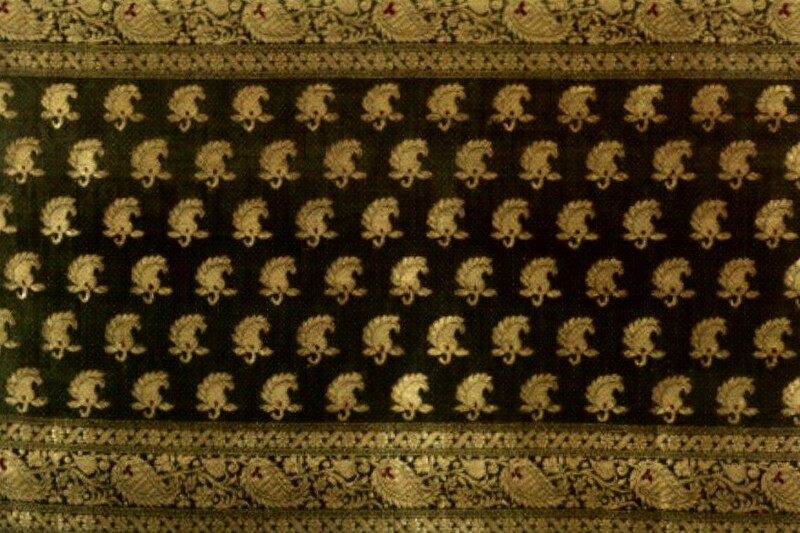 They were incredibly popular rugs from the beginning. Add unique pattern and bold color to their traditional, durable construction—a strong cotton warp holds wool pile, typically knotted with asymmetrical Persian knots--and it comes as no surprise. The rugs we know today as antique Khotan carpets were made primarily in the 18th and 19th centuries in Eastern Turkestan, today part of northwest China's Xinjiang Province. It is unfortunately a region in upheaval, and production and trade have fallen off. The extraordinary Khotan rugs are favorites among collectors and designers, their aesthetic minimalism not only beautiful, but almost prescient.